Press Releases Archives - Page 2 of 8 - IMPACT Pharmaceutical Services, Inc.IMPACT Pharmaceutical Services, Inc.
RESEARCH TRIANGLE PARK, NC: 9 November 2018 – IMPACT is pleased to announce our new Medical Writing Fellowship Program, which started 01 May 2018! This program is for professionals looking to gain experience in the medical/regulatory writing field. Fellows are exposed to a variety of regulatory documents related to the clinical development of investigational and marketed drugs and biologics. This full-time fellowship program runs for approximately 9 months of each year and hosts 2 to 4 fellows per class. Accepted fellows receive a competitive salary and our standard benefit package during their time at IMPACT. RESEARCH TRIANGLE PARK, NC: 26 July 2018 – In the first half of 2018, IMPACT’s employees continued their generous efforts via the Making an IMPACT (MAI) community service initiative. Together, we held several donation drives for various charities, as well as our annual March Madness fundraiser. In February, the MAI team wrote valentines to all our fellow IMPACT colleagues to show how much we appreciate and value the unique contributions of each employee! The MAI team gave personalized notes to every IMPACT employee along with a goodie bag filled with treats. 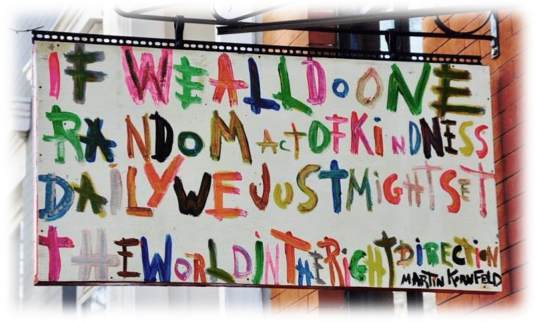 In addition, the MAI team unveiled The Kindness Calendar: a wall-hanging calendar that contains laminated cards describing acts of kindness. Our particular calendar was designed for IMPACT employees to foster our connection with each other and promote camaraderie. In March, IMPACT hosted our 5th annual March Madness NCAA basketball charity bracket fundraiser! Many thanks to the IMPACT employees, family members, and friends who participated; together we raised $630! Following a matching donation from the MAI team, we were able to donate a total of $1500 to the top 3 charities! RESEARCH TRIANGLE PARK, NC: 27 Mar 2018 – In March 2018, Kathryn Tworkoski, PhD, RAC was promoted to the position of Senior Clinical Research Scientist at Impact Pharmaceutical Services, Inc. (IMPACT). Kathryn joined the IMPACT family in November of 2014 as a Clinical Research Scientist. During her time at IMPACT, Kathryn has served as a writer in our early phase group, as well as for multiple NDA/BLA submissions, and has earned her Regulatory Affairs Certification (RAC). She has been lead writer on a diverse array of complex documents, including INDs, CSRs, IBs, protocols, narratives, submission summary documents, manuscripts, and IMPACT blog posts, across a wide range of therapeutic areas. Kathryn has consistently received positive feedback for the quality of her work and critical assessment of data both internally from her IMPACT colleagues and externally from Sponsors. She has also become a mentor and reviewer to junior writers and has always been willing to lend a helping hand to her colleagues whenever needed. RESEARCH TRIANGLE PARK, NC: 24 January 2018 – In the second half of 2017, IMPACT’s employees continued their generous efforts via the Making an IMPACT community service initiative. Together, we held several donation drives for various charities, as well as our annual Season of Giving series of mini-events. In August, Beth Pultorak spearheaded the 4th annual Crayons2Calculators “Fill that Bus!” drive. Crayons2Calculators helps more than 10,000 local children in need by providing their teachers with basic school supplies and educational tools. 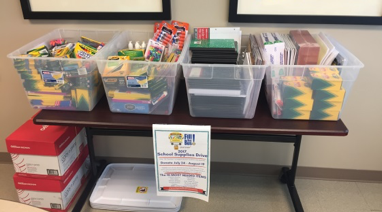 IMPACT employees supported Durham public schools by donating 4 large bins of supplies to Crayons2Calculators’ annual Fill That Bus! event!